The statistics are in, and the results boast resounding numbers. According to Eric Qualman, author of Socialnomics: How Social Media Transforms the Way We Live and Do Business, 96 percent of Generation Y has joined a social network. Although social media sites like Facebook, Twitter, and YouTube are commonly viewed as a personal activity, they are a goldmine for branding and marketing. So, what does this have to do with loss prevention tools? 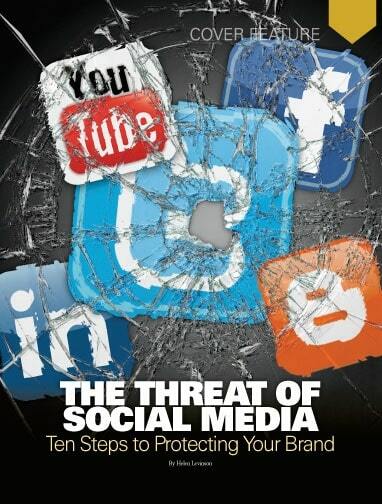 Social media sites have an array of applications, some that may surprise loss prevention professionals. One thing is clear: social media monitoring is here to stay. As of fall 2014, nearly 71% of online adults were using Facebook. According to a Statista report, the number of smartphone social network users was 55.7 million; this number had nearly doubled by 2013. Social media sites have the ability to boost exposure and profit for a company, but they can also cause major damage as well. This is where asset protection and risk management come in. According to a 2009 Deloitte ethics and workplace survey, 74 percent of employed Americans surveyed believe it is easy to damage a brand’s reputation via sites such as Facebook, Twitter, and YouTube. Although that statistic may be frightening, it is possible for social media and areas like asset protection to have a beneficial relationship. In the summer of 2009, Dunkin Donuts launched its new vanilla-flavored drink, Coolatta, by organizing a competition on Facebook. When the competition started, the Dunkin Donuts fan page had almost 800,000 supporters. Within one week, their fan base was composed of 1.1 million and kept growing (they now have more than 13 million fans). Companies have the ability to harness the power of social media, but that power comes from the people, the consumers. When left unmonitored, they also have the capability to destroy any brand, no matter how reputable or well known. The following are 10 tips to consider for protecting your company and your brand by using social media as a loss prevention tool. 1. Assemble a team to closely monitor consumer feedback 24/7. This team should be familiar with sites like Hootsuite, Socialmention and Brandwatch. There should also be a member of this team online at all times. Social media interaction doesn’t end when business hours do, and quick responses can avert a potential disaster. This team should also be responsible for investigating suspicious activity, such as theft, counterfeiting, and other crimes. 2. Establish corporate guidelines that are updated frequently. It’s important to document what your company’s expectations are regarding social media. Lawsuits and public relations nightmares are consequences of the lack of corporate guidelines on this matter. Ensure that there are no gray areas. As technology evolves, so should these guidelines. Some executives say their company does not allow access to online social network sites from the workplace. However, denying access to these sites doesn’t make them disappear. Just because employees cannot access these sites at the office—even though most of them can access them through their mobile device—it doesn’t mean they will not discuss the company, other employees, or your brand at other times. Every company needs to address the responsibilities of the employees when they are on these sites. 3. Establish a response system when monitoring complaints online. The response system would provide specific protocols based on the nature of the complaint or issue, and from there, a response committee can address the issue. To be most effective, a response committee should consist of one director from each department and a set process to follow on how to resolve and respond to a complaint or issue. Don’t assume that just because you have lawyers that you are covered from customer complaints. Today’s tech-savvy consumers beg to differ. You prepare responses for situations such as severe weather, bomb threats, and fire, so why not prepare for this? The following scenario showcases a response system in action. On April 13, 2009, a video of Domino’s employees violating public-health laws by sneezing on food and contaminating other ingredients was released on YouTube. Over 100 million views and over 300,000 comments were posted that day. References to it were in five of the results on the first page of a Google search for “Domino’s” and discussions had spread throughout Twitter. Domino’s Pizza was faced with the challenge of reestablishing their clients’ and investors’ trust. They responded fast and efficiently in order to stop the snowball effect, discredited the content of the video and its producers, and minimized the issue to avoid alarming investors, since the company’s share value had been dancing up and down with the lowest rates in the last five years. They realized they had to reach the same consumers the video had reached. They replied with a YouTube video featuring Patrick Doyle, president of Domino’s Pizza, and created an official Twitter account. Domino’s managed to refocus the attention of clients back to the product—pizza—by building alliances with bloggers and giving away free food in order to reconcile with the product. Even though the release of the video was a PR disaster, the fact that the employees in the video said their names and then explicitly performed the violations helped Domino’s out in their loss prevention department. It was posted on YouTube for public view and fair game for investigation. Social media can work both ways like that. According to GetSafeOnline.org, 25 percent of registered social networking users have posted sensitive personal data on their profiles. The proof is in the post—or the tweet, picture, or video. 4. Use social media monitoring as an investigative loss prevention tool. People post too much valuable information. People post where they are, what they are doing, and, even more importantly, visual elements of what happened through photos and videos. For example, say you set a Google alert for your company. A blog photo pops up describing where the blogger found your brand-new product for half the price. It might not be worth examining, but it doesn’t hurt to look into it. If you decide to pursue it, you now have a lead in a possible counterfeit or theft investigation. While laws regarding the use of evidence from social media sites are still evolving, electronically stored information (EIS) is becoming an accepted form of evidence. According to E-Commerce News Network, 95 percent of all information is electronic. Use this abundance of information for your investigations. 5. Report suspicious activity. Companies should establish an internal response system to report suspicious activity, such as organized retail crime, counterfeiting of goods, dissemination of proprietary information, and cyber-bullying of employees and/or supervisors on social media sites. The response system would consist of a set process on how to report suspicious activity via email and/or a toll-free telephone line. All would be sent to the response committee for internal review, and from there, a protocol would be established. You are responsible for finding the suspicious activity, so make sure your company knows how to use social media as an investigative loss prevention tool—and what to do with the information. The American Medical News released an article in 2011 detailing cases where social media investigations have led to key pieces of evidence collected in insurance fraud. In one case, a Miami private investigator was working for an insurance agency. They were having a hard time keeping tabs on a patient who claimed to be disabled due to injuries from a car accident. The investigator decided to look at the 23-year-old’s Twitter account to see if he could find any evidence that proved otherwise. The man was tweeting like everyone else, describing where he was going and what he was doing. One tweet described his plans to go jet skiing. Investigators, armed with a video camera, went to the site where the young man was jet skiing and caught him on tape. This $500,000 lawsuit against the city was saved by a tweet. 6. Guard your information. With email still the biggest threat to leaking proprietary information, other modes of online communication are quickly catching up. According to Proofpoint, Inc., 17 percent of companies in the U.S. had confidential information exposed on social media sites like Facebook and LinkedIn in 2009. That figure is up from 12 percent in 2008. By following blogs and message boards, monitoring YouTube videos, and keeping an eye on social networks, retailers can be aware of issues that arise and respond quickly instead of simply hoping that nothing comes up. Being a part of these social online communities is a risk, but it’s becoming a necessity as more businesses realize their potential. Just make sure your company is not vulnerable to hackers and the employees know what they can and cannot share. 7. Manage feedback and build brand loyalty. Not all tweets or posts are going to blow up like the Domino’s Pizza fiasco, but don’t underestimate their importance. Social media gives companies a chance to directly interact with their customers. Examining this feedback can assist you in looking at some of the ineffective operations of the business. When a company promptly responds to feedback, positive or negative, it builds brand loyalty. A loyal following is the base of asset protection, and you can use social media as a loss prevention tool to prove you respect your customers with every post. This also gives you the power to put out potential fires the minute they arise. As mentioned before, this is a 24/7 job for a 24/7 world. It’s not just customers you should look out for: it’s employees, too. Many people think that when logging on to social media sites, they become anonymous. All too often, people lose their inhibitions when they realize they have the power to type anything they want without a face-to-face confrontation. Employees need to realize they represent the company every time they contribute to social media sites. This is another reason corporate guidelines are useful for informing employees that, while they have a right to those sites, they also have a responsibility to uphold the image of the company. A disgruntled employee who logs on might do more damage than an angry customer. In early March 2011, someone who had access to the official Chrysler Twitter account used vulgar language in a tweet. The tweet was deleted promptly, but Chrysler has over 7,000 followers, and it was re-tweeted immediately. The source of the tweet was Scott Bartosiewicz, an employee from the social media contractor for Chrysler. He was not a disgruntled employee, but he confused his personal account with the brand account—a mistake that cost him his job. It took seconds for one tweet to tarnish this brand, but don’t let this prevent you from creating an account on Twitter. Chrysler had over 7,000 followers when this incident occurred. They now have over 188,000. Of course, it is unwise to pull an unprofessional stunt for the sake of attention, but it’s a reminder that it’s never the end of the world when it comes to social media. You can rebuild your brand by keeping a professional online reputation. These next tips showcase how your employees are affecting your company online. 8. Check out what your fellow employees are saying on social media sites. Some might say this is an invasion of privacy for the employees, and they have a right to participate in these sites freely. They do have a right, but by posting statuses and pictures on them, they are opening them up to the public. It’s important to check out what the employees are saying because they could be discrediting the brand. They have a right to their own opinions, but under the company guidelines that were discussed before, they should keep a level of professionalism even out of the office on these sites. Think about the content you are posting and how it reflects on you as a person. According to a CareerBuilder survey, 53 percent of employers use social networking sites when researching candidates. This isn’t a free speech issue. Employers are trying to protect their company and brand by getting a candid look at the people working for them or the potential employees. 9. Check out what your fellow employees are saying on social media sites. This is the same step as above, but it is not redundant. According to the U.S. Chamber of Commerce, approximately 75 percent of all employees steal from work, whether it’s time theft, office supplies, or larger products. And 30 percent of all corporate bankruptcies are a direct result of employee theft. How can you bring down these statistics for your company? By using social media as a loss prevention tool. Monitor your employees’ online profiles. If they tweet 20 times between 9:00 and 11:00 a.m. on a workday, it’s likely they are misusing company time. The reason many people share information online is because they think no one is watching. But if an employee is selling a printer on Facebook that looks like the one that just went missing around the office, it might be beneficial to start watching. It may seem too “Big Brother” to keep such a close eye on employees’ social media behavior, but try to think of it as a better-safe-than-sorry technique. Employee theft is a major contributor to shrink, and using social media is just another loss prevention tool to stop it. This doesn’t mean everyone will admit to everything once they get online; nothing in life is ever that easy. But slipups will occur, and you have to ask yourself if you missed them because you weren’t looking. This last tip for is a general rule you should remember whenever participating in a company social networking account. 10. Use “social” etiquette. Everybody knows at least one person who has to blog, tweet, or post about every little thing they did that day, from eating breakfast to cutting their toenails. Don’t be that person. Post something if you have something meaningful to say; otherwise, let it be. Fans and followers won’t forget about you—that is, unless you never do post. Try to keep them engaged frequently with contests, coupons, and events. It’s the whole company’s responsibility to take care of the social media accounts, and that includes building up the brand as well as protecting it. Lastly, don’t berate employees, executives in your company, or even a competitor in any form of social media. Bad-mouthing will not get you anywhere except in trouble. The Internet has changed how we think about the flow of information. The asset protection industry may see a shift from worrying about inventory control to information control, which travels fast and efficiently. You might not have thought these sites were worth using professionally, but they are a significant resource for areas such as building up a brand, investigation, and gathering customer feedback. As discussed here, they’re also a great loss prevention tool. Examining your company’s participation in these sites may lead you to reevaluate the larger issues affecting your company and help prevent future problems. But you have to manage it wisely by creating a team to oversee the accounts. There is no insurance policy regarding the damage to a brand’s reputation as a result of unmonitored social media feedback. A large number of tweets complaining about your company or brand can be as damaging as one of those people stealing half of your inventory, but no policy will bring those customers back as it would the inventory. It is up to you to use these loss prevention tips for social media to manage your company’s online reputation. In order to ensure these effects remain positive, your company should embrace the many benefits of social media, be aware of how social media can hurt your company’s brand and reputation, and use social media as a loss prevention tool to aid your company’s asset protection efforts. If you have not done so, it’s time for a social media audit. For more information, check out the EyeOnLP video that speaks to many of the points discussed in this article. This article was originally published in 2011 and was updated September 19, 2016.